One of the greatest masters of Russian art of the first half of the twentieth century, Alexandr Vasilievich Kuprin was an outstanding master of industrial landscape. Also known as one of the active members of the famous association “Knave of Diamonds”, and a member of the association “Moscow painters.” His teachers were prominent artists, such as Konstantin Yuon, Abram Arkhipov and Konstantin Korovin. Born in 1880 in Borisoglebsk, Alexander Vasilyevich Kuprin grew in Voronezh since the age of three. Here Kuprin studied and later worked as a clerk on the railway. Meanwhile, the attraction to art led him to the evening classes of the Society of Art Lovers. Then, having decided to become an artist, he went to Petersburg (1902). There he attended workshop of A.E. Dmitriev-Kavkazsky, but in 1904 he left Petersburg for Moscow. 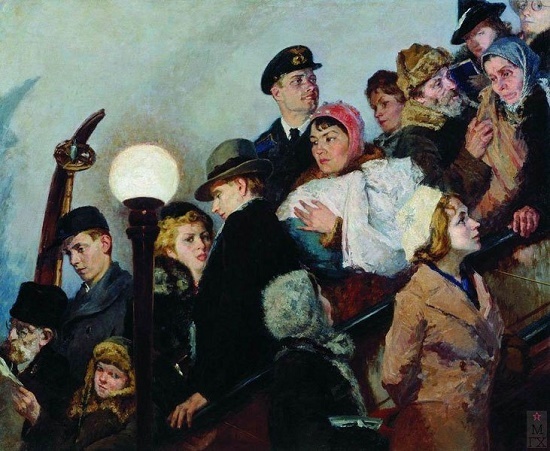 In Moscow he studied in the workshop of prominent artist Konstantin Yuon, and two years later – the Moscow School of Painting, Sculpture and Architecture. At the school, he turns out to be a very unruly student. 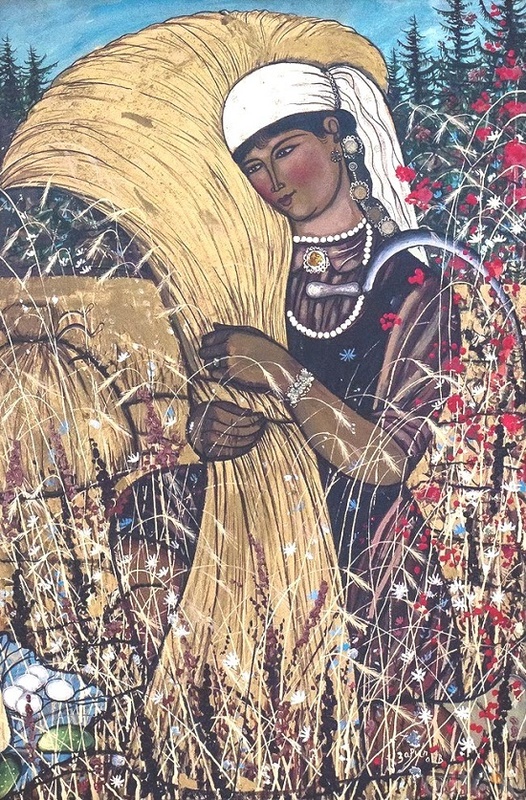 Modern, in particular in 1954, the theme of developing virgin and fallow lands could not but attract the thoughts and feelings of Soviet artists. To reflect in the realistic artistic images the beauty and greatness of the work of the Soviet patriots on virgin lands and to contribute to this victory was one of the important tasks of Soviet art. Many artists showed a deep interest in a grandiose development on the virgin lands, which began on the call of the Communist Party in the spring of 1954 in Kazakhstan, Siberia, and the southern Urals. Artists who visited the virgin lands in the first days and months of its developing, plunged into the thick of a difficult life. They saw how, overcoming difficulties, the Soviet people turned huge spaces of untouched land into fertile fields. 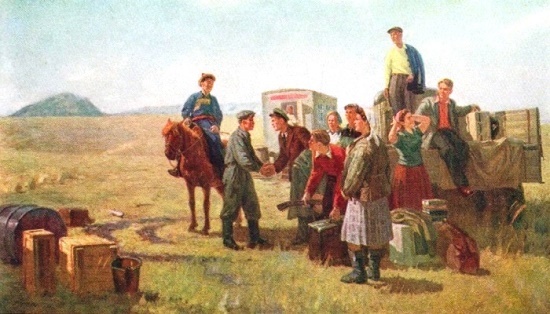 Having lived side by side with tractor drivers, agronomists, geodesists, and workers of other professions who voluntarily gathered from different parts of the socialist homeland, the artists saw the heroic days of developing the virgin lands closely. 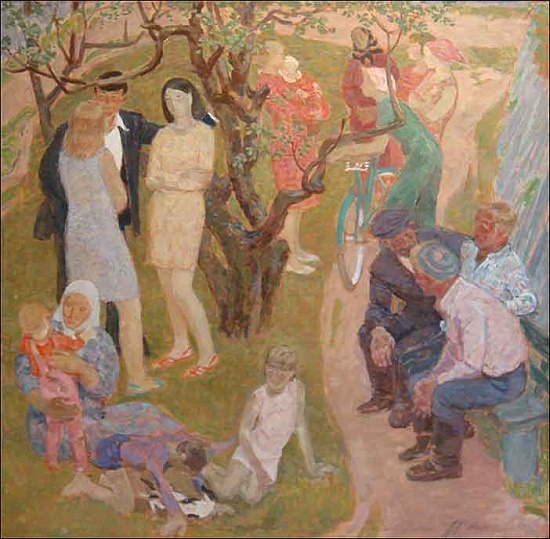 Some of these sketches and paintings were shown at the All-Union Art Exhibition in 1954 and at an exhibition in the Palace of Culture of the I.V. 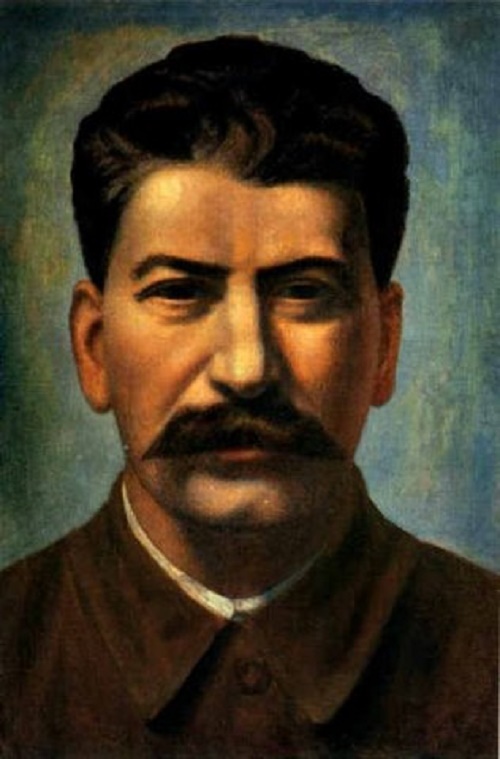 Stalin. The publishing house “Soviet Artist”, having selected a part of the works, published the album “Etudes, pictures from virgin land” – works by artists in the spring and summer of 1954. Born in 1889, Grigory Mikhailovich Shegal is a talented Soviet painter, the author of paintings on the historical-revolutionary and everyday themes. The wonderful landscape painter, Grigory Mikhailovich Shegal was a man of broad artistic interests, high culture and an active life position. However, the path to professional activity was long and difficult for Shegal. Reading the biography of the master, you involuntarily marvel at his diligence, perseverance and purposefulness. Born in the provincial city of Kozelsk, the future artist lost his father very early. So, talented and versatile gifted self-taught – he had to earn his own bread from childhood. The only rejoicing for him was reading. It awoke in him an unconscious desire to transfer to fragments of paper images born in the soul, inspired by books and impressions of the surrounding world. A conscious desire to become an artist appeared a little later when he worked as an apprentice in the engraving workshop in Smolensk. Spending all his meager earnings for classes with a tutor, Shegal for three years prepared for passing the external examinations for the certificate of maturity and successfully withstood them. Next, he moved to St. Petersburg, where in 1912 he entered the Drawing School of the Society for the Encouragement of Arts. Here he studied in the workshops of such prominent Soviet masters as Nikolay Rerikh and Arkady Rylov. In 1917-1918, Shegal spent a short time at the Academy of Arts, workshops of G. Zaleman and I. Bilibin and completed his professional education in 1925, being a mature man. 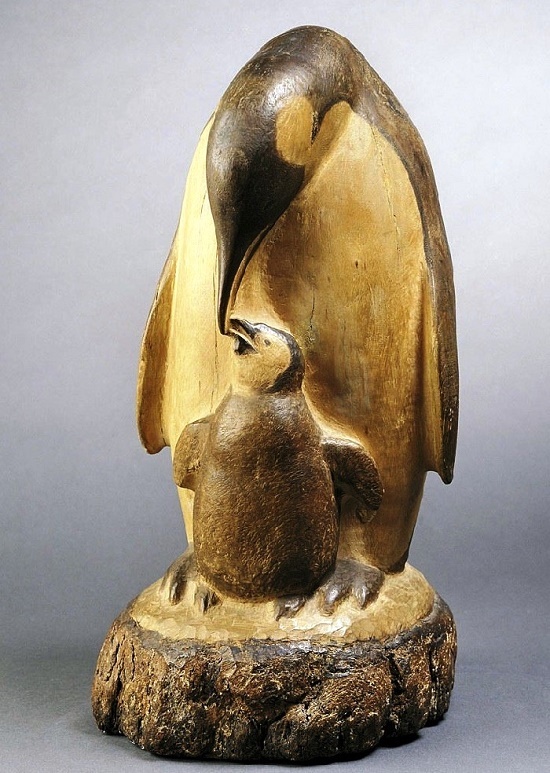 Born in Moscow in 1883, Vasily Alekseevich Vatagin – Russian animal painter, sculptor and scientist-zoologist. The founder of the Darwin Museum, Alexander Fedorovich Kotts, was one of the first to draw attention to the talent of the young artist. Practically from the very foundation of the museum in 1907, the collaboration of the painter and sculptor V.A. Vatagin and director of the museum A. F. Kotts began. Vatagin, rightfully considered co-founder of the Darwin Museum has created more than 400 paintings, as well as about 100 sculptural works for 40 years of work. Since childhood he was fond of drawing, and aged 15 he attended the studio of watercolor artist NA Martynov. In 1902, Vasily entered the natural department of the Physics and Mathematics Faculty of Moscow University. Also, he studied at the studio of the painter K. Yuon. After graduating from the university, the artist made several trips to the zoological gardens of Western Europe, visited Central Asia, India, and northern Russia. There he performed a large number of sketches of animals and birds, which later became indispensable helpers in various works. Among them – zoological illustration, easel painting, book illustration and sculpture. Soviet Russian avant-garde artist Pavel Filonov – a genius of the Soviet avant-garde. The famous, mysterious and largely unknown yet artist and man. December 3, 2018 was exactly 77 years since the day of his death. Filonov died in the most difficult winter of 1941 in Leningrad. Exhausted to the extreme, he guarded his house, and most importantly, his work – the work of all life, from the “lighters” on the icy attic of the house. Once fell down, and the next day he could not get up any more. He died of pneumonia and dystrophy. What was he like? Tall, big, with “cherry eyes and pale cheekbones …” – wrote a friend of Filonov poet Velimir Khlebnikov, with whom they made friends in 1910. He also told about his friend: “I met an artist and asked if he would go to war. He replied: “I, too, am at war, not for space, but for time. I’m sitting in the trench and taking a scrap of time from the past. My duty is equally heavy, as the troops for space … “. Born September 29, 1907 in Vitebsk, Mikhail Davidovich Natarevich received his first art education in Vitebsk, in the studio of Yu. Peng, a painter and teacher who graduated from the Imperial Academy of Arts in St. Petersburg. 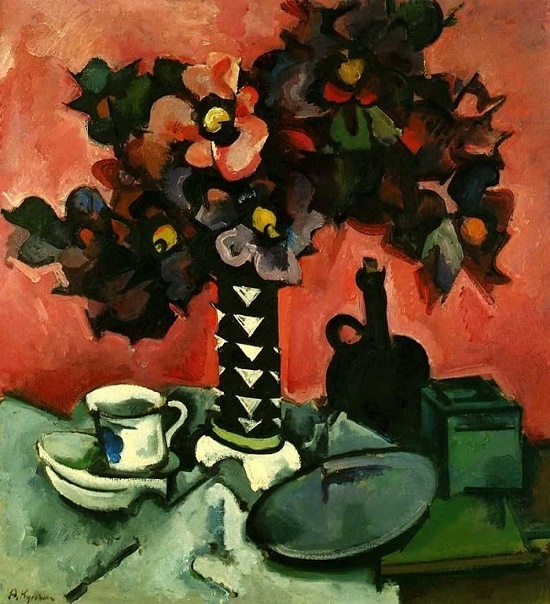 Natarevich – Russian Soviet artist, painter, member of the Leningrad organization of the Union of Artists of the RSFSR. In 1932 he came to Leningrad and entered the preparatory classes at the All-Russian Academy of Arts. And two years later he became a student of the painting faculty of the Leningrad Institute of Painting, Sculpture and Architecture named after I. Repin. His teachers in drawing were M. Bernstein and S. Abugov, and teacher in painting – Alexander Savinov.